When Will We See The Pyramids Again? The questions as to when travel to Egypt will resume, and Egyptian itineraries re-established are big ones among the decision makers in the US travel and tourism industry, and are being discussed daily. The United States Tour Operators Association (USTOA) a large group of tour operators who managed to pull their clients out of Egypt during the successful uprising, indicated only a decided minority of their members would arrange travel for clients who wanted to go now. Most said they would make a determination about resuming tours to Egypt this week as the situation becomes clearer. Others are waiting until at least until mid-to-end of March to make that decision. Meanwhile, Royal Caribbean Cruise Lines told AOL Travel News that it will cancel its RC and Azamara Club Cruises to Egypt through June. Spokesperson Cynthia Martinez was reported as saying that Royal Caribbean ships will sail to Turkey and Greece instead. Also, the Associated Press reported that one of the world’s great museums, the Egyptian Museum in Cairo, which houses an astonishing display of antiquities, was all but deserted. It’s one of the country’s premier attractions. Not surprising news, because the museum is very close to Tahrir Square, the center and seat of the uprising. Antiquities minister, Zahi Hawass, also said that there was some looting of artifacts. He too is waiting to see how things play out before ordering the museum to reopen. Meanwhile, Egypt’s most famous attractions, the Pyramids of Giza reopened, but to very few visitors. As we wrote earlier, tourism is Egypt’s economic and hard currency lifeblood, with 14.7 million visitors last year generating about 11billion dollars in revenue for the African-Arab country. 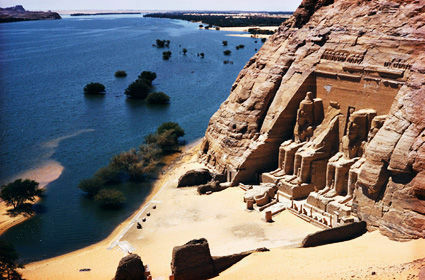 With most cruise lines canceling Egypt as a destination, and the hugely lucrative and popular Nile Rive Cruises stopped, world tourism officials and tour operators are eager for business to return to normal, or as close to normal as possible. Mohamed Kamal, CEO of a major Red Sea construction company and major builder of travel and tourism properties told Bloomberg that he fully expects fully expects tourism to rebound because it has proven resilient throughout past crises. But no previous crisis has been this total and historic. Further, he added, correctly, that during and after a crises, many concessions are offered to returning travelers to jump start business. And while the Egyptian pound has dropped against the dollar since the crisis began, that won’t matter if travelers don’t feel safe. For now, tourism industries are eager to resume business and hope the return to some kind of normalcy is only weeks’, or at worst, a few months’ away.